Anna’s Secret Legacy-A compelling Story How Love Is The Strongest Weapon When Nations Collide, And Evil Threatens! Blue Bell, PA- In the early 1940’s, as the world sits in a state of death-watch anxiety waiting for Nazi Germany to actualize its declaimed plan for global dominance, a secret has been uncovered that could fantastically benefit humanity, or, if stolen by the aggressors, could lead to untold death and defeat. 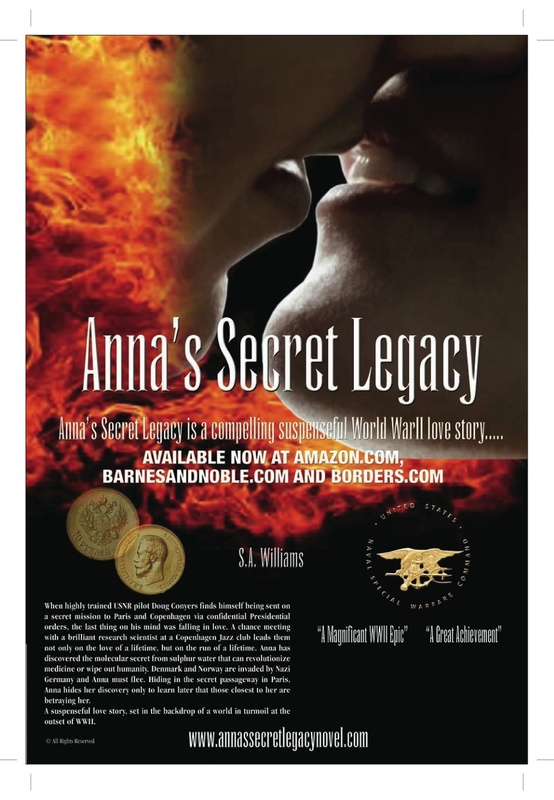 “Anna’s Secret Legacy,” a historical novel by first-time author, S.A Williams, conveys the fearful atmosphere of the time, along with the incredible heroism that is poised against the Nazi plan. Set in Copenhagen and Paris, the novel explores the less-known invasion of Denmark and the actions a few brave souls take to keep the Danish national treasure out of Nazi hands. More importantly, it tells of a secret formula discerned by a leading female microbiologist that, should it fall into the Nazis’ grasp, could turn the coming World War into a victory for the Axis powers. Stunningly beautiful and intellectually gifted, Anna is an Oxford-trained research scientist who grew up in a far-off town in Russia where mystical powers laced about her childhood, leaving jeweled memories of magical rituals that imparted a wisdom no Western scientist could comprehend. With advanced research methods, she is able to unlock the mystery of healing from a sacred sulphur spring, information the Nazis will kill to obtain. Enter Doug Conyers, a dashing American naval pilot who is assigned with his buddy and fellow pilot, Lenny, to uncover German plans and, when possible, derail them, without fingerprints or a trail, as America is still neutral. When Doug and Anna meet, a powerful “chemistry” matches the healing chemistry she has discovered… and love breaks out at the same moment as war. As desperation becomes endemic, Britta, Anna’s beloved hemophiliac sister, now with the prospect of a cure, ends up the apparent victim to Nazi fury and frustration. Events unfold fast as the Germans strike into Denmark. Anna has to leave for shelter at a convent in Paris. Doug must return to America to report to President Roosevelt. Betrayals abound as the Nazis dangle gold before their brutalities, but loyalties are strengthened as well with Europe’s fate resting in the balance. With each page, personal battles take on worldwide significance as blood is spilled in the chambers of Copenhagen and Paris. This entry was posted in Anna's Secret Legacy, Anna's Secret Legacy Blog, Annas secret legacy novel, Barnes & Noble, Book Blog, Book Signing, Gold, Love Affair, Love affair, Scientific Discovery, spies, Travel, Uncategorized, World War II. Bookmark the permalink.